This year at RetroFIT was an extremely busy and successful one for all of our athletes. Everyone from our middle schoolers, to our Division 1 college athletes found great success. We would like to honor all of our athletes from this year with this post. Please share it with everyone you know! This past spring, our DLC Owls (photo, left), coached by JJ Rutherford, won the Rocky Mountain Lacrosse Jamboree for U13 age group. All State for field hockey. She touted a .900 save percentage, 141 total saves, and had five shutouts. She capped off her magnificent season by announcing her commitment to the University of Michigan. The Regis Jesuit High School boys’ lacrosse team had four All American Selections, along with many other awards. Regis Jesuit High School girls’ lacrosse team had two selections to the all-continental league first team, Kathleen Roe (photo, left) and Nina Kelly (photo, right). Kathleen Roe also won the continental league player of the year award, was First Team All State and made The Denver Post’s All Colorado Team. Katie Schilmoeller made the all-continental league second team. Kate MacDonald, Mathison Davis, Noa Crowley and Mackenzie Reifsnider all made Second Team All League. Davis Carter committed to Southern Indiana University for basketball. Davis spent one year playing junior college before he found the right school. Coach Jamie and his track athletes both saw great success as well. Jamie won his third straight state title with the Niwot High School girls’ track team. Here is a list of all his athletes that made First Team All State as well. 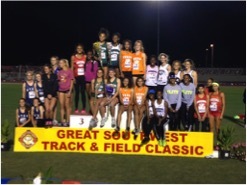 Jamie and his athletes also traveled to New Mexico for the Great South West Track Meet from June 5-7. His Colorado crew (in green, photo, right) won 1st place and completed a three peat! Lorne Jenkins, a rising junior at Campbell University, was selected First Team All Conference in track and field for hurdles and jumps. Joe Schroer, who is in Army ROTC at the University of Kansas, set a goal last year to perform 70 push ups in two minutes. When it came time for testing, he shattered his previous goal with a personal record of 85. Allie Peper, Ralston Valley High School hockey player and rising senior, committed to play at Harvard University. Anya Gersoff, a junior from Princeton University (photo, right), made it to the NCAA Championship Quarter Finals. She tallied 22 goals, six assists, and 23 ground balls (Princeton Athletic Communications). Dan Shelanksi, one of our newest athletes and rising junior, was named second team all state in boys’ lacrosse with Denver East High School Angels. He won 109 face-offs and racked up 99 ground balls. Our Thunderridge High School girls’ lacrosse players also had an incredible year. Sara Stewart and Kirstin Greenlaw made First Team All League. Meghan Gordon, Bailey McCue and Shelby Squire each made Second Team All League. Caroline Perry (photo, left), Cherry Creek High School, was selected a First Team All American, made The Denver Post’s All Colorado Team, and was selected as a 1st Team All State player. She had 63 goals 22 assists, and 26 ground balls. She also was named MVP of the high school girls’ division in the Vail Shootout. Caroline will play for the University of Colorado at Boulder Buffs next season. 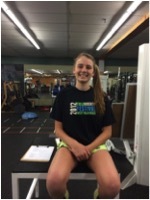 Atlee Witt, a rising senior at Arapahoe High School, had a great year. She is a great role model both on and off the field. She scored a perfect 36 on her ACT and was inducted into the National Honor Society. John Campbell, a senior from Denver South High School, enlisted in the United States Marine Corps. Olivia Baglieri achieved a 3rd degree blackbelt in Tae Kwon Do. Audrey Payne, a Kent Denver High School junior, made First Team All State in soccer. Colorado Academy girls’ lacrosse had a fantastic season. Team Captain Emma Richards, was her team MVP, First Team All Conference, and made The Denver Post’s All Colorado Team. Henley Hall won the coaches’ award, Second Team All Conference, and made The Denver Post’s All Colorado Team. Jackie Melberg won Second Team All Conference. These girls helped Colorado Academy win the 2015 Colorado Lacrosse State Championship. Erin O’Shaughnessy, a junior at Kent Denver High School, made Second Team All State in girls’ lacrosse, and made The Denver Post’s All Colorado Team. Kendra Lanuza, a senior from Chatfield High School, made First Team All State, was named The Denver Post’s girls’ lacrosse player of the year, and made The Denver Post’s All Colorado Team. Kendra will play at the nationally ranked University of Denver next season. Jen Lanuza of Chatfield High School, made Second Team All State. Darcy Neureiter (photo, right), a Kent Denver High School senior, committed to play field hockey at Wesleyan University, received the Christine D. Bullard Athletic Award at Kent Denver: Awarded to a member of a varsity squad who, by her exemplary spirit, outstanding sportsmanship and sound team play, has contributed most to the girls athletic program. 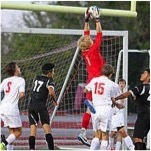 Will Palmquist, (photo, left) a rising senior from Denver East High School, made First Team All State in boys soccer. He committed to the University of Denver this season too. Great things await him as he begins his senior season. Rachael Walker (photo, right), a rising sophomore at the University of Oregon, was named MVP of the girls’ elite division in the Vail Shootout. It truly has been an incredible year for all of our athletes. We at RetroFIT Training Center and Athletic Revolution Central Denver are ever grateful for all of you and wish our sincerest congratulations for all that you’ve accomplished. We can’t wait to see what next year has in store! For all your fitness and performance needs please contact us at www.billycorbettsretrofit.com or call 303.758.3138.